"Gene and Bill are as funny in person as they are in their comic strip. They'll tell you important things as they keep you laughing nonstop with their unique perspectives on libraries, books, customer service, or whatever else you can convince them to talk about." "You received the highest scores for both Quality of Presentation and for Instructor Effectiveness of all the presentations at our All Staff Institute Day. More than 100 staff members want you to return next year, and many want you here every year going forward! I think it is safe to say that the CPL staff admires your wit and your humor, and are grateful that you are so insightful about their daily work." "Bill Barnes was a smash hit at the Florida Library Association 2013 conference! He kept us laughing while reminding us of our (and our customers') foibles. Learning how he and his partner develop their comic strips was interesting and seeing it in action as he created a strip from one of our attendees “worst library story” was outstanding." We love making people laugh on the web and in person. We've delivered professional keynotes to conferences, universities, library systems, and corporate gatherings in over 40 states and internationally*. Our peculiar insights into librarianship and customer service leave attendees smiling and talking among themselves. They depart energized, validated, and uplifted. We’d love to speak to you and your group, wherever you are. With each keynote we offer a breakout session -- these are less formal talks, and sometimes we also offer early versions of new keynotes we're working on. Here's how to hire us. We've got two great keynotes for professional gatherings. This keynote speaks to customer service experiences beyond the reference desk, and is suitable for all library employees, even those who only deal with internal customers. This is our newest keynote, and Gene is still tinkering with it a bit. 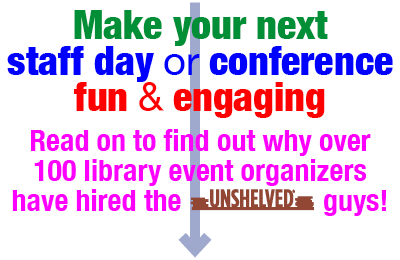 This speech has garnered standing ovations at dozens of state and regional library conferences, library schools, library staff development days, and corporate customer meetings. It is appropriate for all kinds of librarians: public, school, academic, and special**. Here's a video clip of our opening skit, the Unshelved Library Simulator. We are longtime opponents of censorship, and in this talk you will gain a deeper understanding of who you're up against in the fight for intellectual freedom. Please note that this breakout is back in development. A rough, newly reworked version may be available with enough notice. For keynotes at professional gatherings such as staff days and conferences, we charge a speaking fee that varies with distance and venue, plus expenses (economy travel, accomodation, meals). For more information, references, availability, and a price quote, please contact Gene with as much detail about your event as possible. For more information on hiring Bill to speak about cartooning to the public at your library, please contact him directly.